How to target potential Russian buyers? It is important to remember that Russia is a developing country and that the principal of 'normal' people buying abroad is a relatively new one. However the interest is strong, money is available and there is a staunch desire to own property abroad. Russia is also a vast country covering 10 time zones. Whilst much of the wealth is concentrated in Moscow & St. Petersburg, the emerging "mass influent" are now to be found in the major cities throughout the Russian Federation. To target potential investors a creative marketing plan should include both Print advertising and participation in exhibitions. With our magazine and exhibitions, backed with 19 years of experience we are highly positioned to assist you. 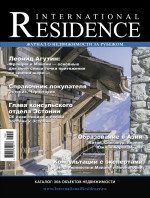 Created in 2003, International Residence soon established itself as "Russia's leading overseas property magazine." Printed twice a year, 35,000 copies of each issue are published and distributed to your target audience. Unlike many countries, Russian's love to read magazines and this tendency is still growing. The St. Petersburg International Property Shows are held in Russia’s 2nd largest city in Spring & Autumn. Now in the purpose built Sibur Arena these shows, established in 2008, are firmly established as the leading property show in St. Petersburg attracting in excess of 6,500 unique visitors and on average 140+ participating developers and agents. The Bulgarian Home Exhibition is held in February each year specifically targeting interest in Bulgarian real estate. Create in 2009 this show continues to attract more than 5,500 visitors and 70+ exhibitors. The leading B2C event for the overseas property sector in Russia is the Moscow International Property Workshop & Conference held prior to the Moscow Property Shows, providing International developers and agents with an opportunity to meet face-to-face with carefully selected Russian real estate professionals. Created in 2010, the Moscow Golf & Luxury Property Show provides an opportunity for developers and agents to showcase premier real estate and golf developments. With a strong golf theme and golf practice facilities the event attracts higher level visitors with larger budgetary expectations. The Moscow Golf Show is held in conjunction with the Moscow Golf & Luxury Property Show in April. By providing driving nets, a putting green and indoor competitions the Moscow Golf Show attracts Russian golfing enthusiasts prior to the opening of the season. Participate in one of our events and get 15% discount for any advertisement in the International Residence maqazine!